Apart from all the walls of the room you also have a midground layer (which could be furniture for example) and a curtains layer to give additional complexity and depth. 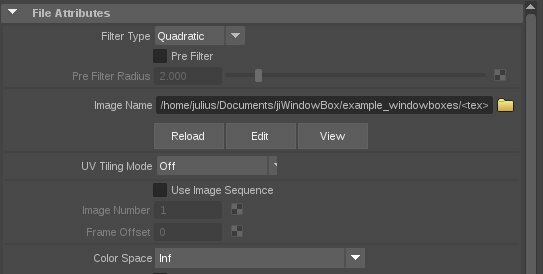 The textures can be created in your favorite 2D program, but if you have access to Nuke and you are familiar with it I also added an example Nuke script to the package for creating and laying out your own window boxes. With it you get a few convenience features so you won’t have to worry about making sure everything is placed in the correct spot. Make sure you only have an alpha in the midground and curtains area. All walls, the ceiling and the floor should have a black alpha. For use with RenderMan and Arnold, make sure to convert your textures to mipmapped texture files using maketx (Arnold) or txmake (RenderMan). This is mainly for performance reasons but is a requirement for RenderMan. If you are exporting your texture in an initial format that keeps bounding boxes (like OpenEXR), make sure that the bounding box matches your format exactly. Most renderers will take the bounds of the data window over the actual display window (this is also the case when converting to .tex files). If your bounds are bigger or smaller than your output format it will mess up the alignment in the shader. The midground and curtains layer should be unpremultiplied. Premultiplication is happening in the shader, so if your input midground/curtains area is already premultiplied you will most likely get dark edges. Playing with OSL #3: Windowbox / Interior Mapping Shader from Julius Ihle on Vimeo. If you want to give it a go you can download it from HERE. The package contains the source and compiled .osl and .oso files for Blender, Arnold and RenderMan, but it should work in any other renderer with OSL support. Example windowboxes shown in the demo can be downloaded HERE. For use with Arnold just put the compiled .oso into a folder that you append to your $ARNOLD_PLUGIN_PATH and for RenderMan either load the .oso via a PxrOSL node or do it the nice way. I haven’t tested it in production yet, so use with caution and modify as needed :) Some bits could be more efficient here and there… to be continued… maybe. I had quite a few people requesting a VRay version for this one as well. VRay does things a little bit different but I think I hacked together a working version and updated the download link above. As a word of warning, I found OSL in VRay to not be that stable (might very likely be inefficiency on my side, too ;) ). Also I could not get live IPR updates working when changing parameters in the shader, but once you made all your tweaks it should render normally. You can load in the .oso file in a VRayTexOSL node. Instead of specifying a file directly within the shader, you have to load it separately (in the case of Maya a File node seems to work nicely) and then plug it into the Vray Input Tex. The links have been updated again specifically for those requesting support for DCC apps which have Z as their Up-Axis (e.g. 3ds Max). There’s a new switch called zUpAxis for the VRay, Arnold and RenderMan versions now. OFF (which is the default) uses Y as the up-Axis, ON uses Z as the up-Axis. Make sure you load the compiled .oso file, not the .osl file. I got compiler issues with when trying to use it directly, but the compiled .oso seems to work in Max. As of 03.04.2017 Zap was gracious enough to add it to the Max OSL Repo on github as well! Luckily VRay does provide arbitrary user data options just like Arnold and PRMan and that actually seems to be working nicely. To get it working set up the material like before and assign it to all objects. In your texture node instead of having an absolute path to your texture file (e.g. /path/to/file.exr) use a user data string encapsulated in <> (e.g. /path/to/<tex>). Next you have to add the part of the filename to replace <tex> with as an attribute on your geometry. 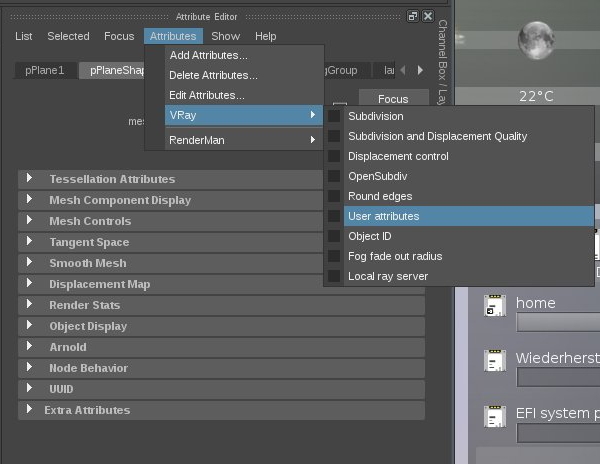 In 3ds Max right click on your geo and select Object Properties… . In the User Defined tab set the filename of your user data here (tex=file.exr). The downside of using this method is that you cannot have individual setups for all the other shader parameters like roomdepth, etc. as they are not mappable. From what I heard Chaosgroup is pretty quick at handing out fixes for small things like this. They have been aware of the issue for a little while now, so hopefully a hotfix will be released soon :) FWIW I heard it’s working with earlier VRay releases, too. A while ago I received an EMail by James Dean who kindly made slight modifications to the shader code to make it usable in Lightwave and Octane. I updated the zip above to contain his version which hopefully does the trick for those of you that are using either of the 2. Blown away Julius. So effective and smart. Once again, well done sir! Please keep it up I don’t see this kind of stuff very often. I try this in Renderman 21.5 (Maya 2017) and it doesn’t work. I Load the “jiWindowBox_PRMan.oso” in a PxrOSL node. I connect it in a PxrConstant shader assigned to a plane. My PxrOSL node can’t read the texture file and my plane rendering only a blue color. can you help me on that trouble? Can you try converting that texture to a .tex file? After you have done that verify that the texture is working and make sure you use the correct path. It works fine with a .tex file, thank you. However I’m not able to use “Midground” and “Curtain”, I switch to diferents value but nothing appears… Have you got an idea what I’m doing bad? Yes, you are totally right – that was my bad! The jiWindowBox_template texture was an older version that I had which did not have an alpha for the curtains and midground layer! All the other textures should hopefully be working. Thanks for your feedback and for testing! Hopefully it’s all working for you now! Ok I missed that in this texture. I tried with other one and It works perfectly. Thank you for this tool and your quick reply. Hi Julius, this looks great and incredibly useful! I’m having trouble getting it to work properly in VRay, and each of the .oso files that you’ve provided behave slightly differently. I don’t suppose you have experience using OSL in Vray? I haven’t had access to VRay in quite a while but I’ll see if I can get ahold of a demo version to test it out. Julius, Matt, anyone, I’m also pretty much interested to get a compatible version for Vray. If you find any way to make it available for Vray, do not hesitate to publish it ! Unfortunately I cannot access that link, but thanks for sharing! I just updated mine with a version for VRay, too! Thanks Julius, It works perfectly, I just tested it on Vray 3.5 in maya. Thanks for this; would also love a Vray version for this shader. I updated the download link and article above with a version for VRay! Let me know if it works for you! Thanks a lot for doing it so quickly! I’m still having no luck in Max, and I’m wondering if it’s because Max uses Z up, and Maya uses Y up? I was using VRay 3.6 on my side, maybe that’s a problem if you are trying to use it with older versions. Can you give specifics about the errors? You shouldn’t have to compile it yourself, just use the provided .oso. Please do something for Max. I’ve been waiting for something like that for ages. I will hopefully get to it in the next couple of days… I’ll update the article as soon as I’ve got something going. Thanks a lot for the kind words and the screenshot to illustrate the problem! I however probably won’t get to it before Saturday, but feel free to check back in towards the end of the week. I’ll update the article as soon as I have news. The fix to get it working for Max was easier than expected… Play around with it and let me know if it does the trick for you! Tested with Max 2018 + MaxToA and VRay 3.6. Are you trying to load the .osl file? I get a lot of errors with that, too. The VRay OSL compiler seems to have more restrictions from what I can tell, but it might also be something that I’m missing. If you load the .oso file it should work. Make sure you are loading it with a VRayTexOSL node, NOT a VRayMtlOSL node. It works. Thank you Julius the Genius ! Thanks for the osl version of your shader for 3ds max and vray. It works very well. The only problem I’m running into is that it seems to only evaluate one instance of the shader at a time. so if I have 4 squares and they have 4 different vray materials with your osl with different bitmap rooms, only one of them renders across all 4 squares. If any one else using vray and 3ds max 2016 (or other versions) experiences the same thing I’d like to know. Could be an anomaly on my end or just a max thing overall. I’m having the same problem unfortunately! I’ve even tried duplicating the .oso file and renaming them so that each texture node has its own .oso, but am having no luck! Yep, same behaviour here. Only one instance of the texture is rendered. Thanks Julius. That method works fine. Hopefully the Chaosgroup will contact you with some additional insight as to how their osl implementation works. Thanks again for taking time to do this. Just got a reply from Vlado. It’s a bug and they are aware of the issue and will plug a fix into the next hotfix release! Awesome job! I’ve placed the osl file in the correct path in c4d. It loads the shader but in the console I get an OIIO error. Is this shader c4d compatible or only Maya? In theory it should work regardless of the host-app. It’s mainly about the renderer… Which one are you using? If you get an oiio error that might suggest something is wrong with the image you are plugging in. Can you share the full error message you are getting? Sorry for the delayed reply. This error sounds a lot like you are creating a separate node in which you specify your image and try to connect that to the filename of the windowbox shader. If that is what you are doing try to specify the filename as a normal string directly in the filename input (like I did in the demo video). Oh wow! What a bloody simple fix! I was indeed creating a texture node and connecting it to the input. When i copy the string it works like a charm! Awesome work mate, can’t wait to make some stuff with this! Cool, glad to hear it’s working! Feel free to share your renders if you have something! Thank you very much for the shader. Working great so far in Max and Vray. But I have one big problem, I haven’t managed to get my own exr texture working with the shader. I tried with Photoshop and Affinity Photo, but it simply doesnt work. It seems that he doesnt really use the alpha map. Is there any trick I have to do to make in work via photoshop? I just had a look at exporting from Photoshop and it seems to work fine. What you need to make sure is that you only have values in your alpha in the curtains and midground area. Make sure there are no values above 0 anywhere else. thank you very much for your quick answer. I got it working. I saved the exr via the exr-io plugin for photoshop, this caused the issue. Saving it via the normal exr format option from photshop worked without any problems! Another question, is it possible to get shadows from the curtain and/or midground layers? So that you get nice shadows in the room itself. This would make the shader even more “believable”. Cool, good to know that it works! This shader is solely texture based mainly for performance reasons (and secondary because anything else would probably be way over my head :) ), so unfortunately there won’t be any way to get things like shadows. You can of course bake in some shadows in the textures. Keep in mind this is really only meant for midground and background assets. For closeups you’ll be better off modeling an actual room + interior. Great to hear that you found it useful! Enjoy the holidays, too! The shader just work well for any aspect you desire, as long as you tweak your texture to reflect the aspect ratio of the plane you are trying to map it to. So if your window has a width of 3 and a height of 1 (3:1 aspect) for example you need to make sure the floor, back and ceiling are stretched 3 times as much in comparison to a 1:1 (square) aspect. It’s not hugely obvious at an aspect of 2:1 but when you go up to 3:1 or 4:1 it starts to look really crazy. Adding extra depth also adds even more distortion. Any ideas what I am doing wrong? I am using v-ray & 3ds max. Yep, that does look indeed a bit odd. I have an idea what could be the issue, but unfortunately I am not able to test it as my VRay trial has run out. I’ll try to see if I can extend the trial for a bit, but can’t make any promises unfortunately. I find the OSL implementation in VRay a bit odd sometimes as it’s quite different from other renderers, but it’s likely I am missing something as well. Seems to be something VRay does different. I tested it in Arnold, RenderMan and Blender and don’t see that issue. Can you try freezing your transformations, maybe? Thanks for the quick response. Tried freezing my transforms but that doesn’t fix anything. I might be able to get you a remote vray licence while you solve the issue if that helps? Just let me know if/when you are free and i can shoot over the licence server details. I’ll just stick to 2:1 & 1:1 aspect ratios for now! First of all, impressive work you’ve developed here. Are there any news from Chaosgroup regarding the use of multiple shaders with different textures? Your workaround works fine for now, but would be really good to have a fix for multiple materials, for workflow’s sake. 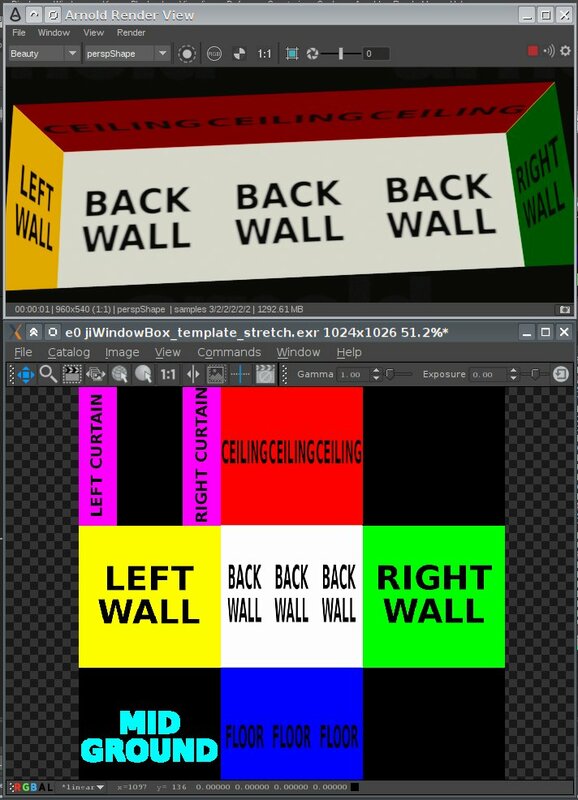 Also regarding 3dsmax+vray, the use of such OSL/OSO shaders seems a bit unstable as we have random 3dsmax crashes.. not always, but sometimes after freshly opening a scene with some VRayOSLTex materials already previously applied, 3dsmax immediately crashes as we open the material editor for example.. seems like it even has some issues displaying the material preview in the sample slots..? does anybody have the same instability once in a while ? could it be a vray handling issue or some bug(?) inside the vray OSO file shader itself ? Would be great to have a hotfix soon so that these shaders could be properly implemented in our workflow. Thanks for the kind words. I am unfortunately not up to date with Chaosgroup’s latest releases but from what I understand they are doing very quick turnarounds, so I’d look out for nightly builds and their release notes if anything indicates texture OSL fixes. It’s unfortunate to hear you are having stability issues. I had the same with Max+VRay, but I was hoping it was due to the fact that I was running it only in a virtual machine. Interestingly Vray for Maya was a good deal more stable (although I still had the occasional crash), while Arnold+Max did not crash once on me, even tough I was just running it on a virtual machine. I found VRay’s OSL implementation does a few things different from other renderers and even some simple tests were a bit crash-y on my end. It’s likely I am doing something not as intended, but unfortunately my VRay trial has run out, so I am unsure as to when I can hop back on it. My best bet for now would be to watch out for updates from Chaosgroup like I mentioned previously. Other than that – watch this space… Hopefully I can have a look again soon. I’m humbled you’ve found your way here and would like to add it to the 3ds Max OSL github repository! I’d certainly be happy to move foreward with this. If you need a special written permission or any additional information feel free to shoot me an EMail at julius.ihle@online.de! The setup in blender is the same as for the other packages. The filename parameter is a direct texture input, so you can give it a path to the texture file in the jiWindowBox node directly. If you try to connect anything other than a string to the filename it will error out. Is there an example .blend available somewhere? I haven’t been able to get this going in blender so far, but would love to be able to make use of this. I suspect it’s something simple I am missing; an example blend file would clear up the confusion nicely. Sorry for the delayed reply. At which point are you stuck exactly? Awesome work Julius! I remember watching something similar in Avengers (NY scene) and was blown away by it. Haven’t been able to get it to work in octane/c4d. Probably doing it wrong? tried copying/pasting the code to the osl texture node and compiling it. Creates the parameters and projects the texture, only that the projection seems wrong. Any thoughts? Either way, thanks for sharing! If not – can you post a screenshot of how you are using it and the rendered result? Maybe that gives some indications as to what might have gone wrong. I’m having an issue with reading the latlong from you nuke script. It says reference_latlong.exte9: can’t read front file… am I missing a file? I don’t see it in the folder that I downloaded it with. Thanks!! Sorry for the late reply! Not sure what that’d be. Is there a full error message you can paste? All the files should be included in the zip and the Nuke workflow is explained in the second half of the video on vimeo. This looks amazing! Is there any chance to do an update for Redshift for Maya? Would really appreciate it! Or is there a way to use it inside Redshift for Maya as is? Im trying to get this to work in C4D/OCTANE. Everything compiles fine but projection looks strange. lots of stretched and warped images. I’d post you a image if i knew how.. Perhaps could email you? Would be amazing for production to get this working. Thanks so much for your effort! Thank you for sharing! I didn’t find your Nuke template in an archive, can you please send it to me or upload somewhere?